Joy Payton did an investigation into the worst property tax delinquents in Philadelphia, complete with a zoom-in map. Enforcement of tax collection seems pretty basic, but Philly’s budget and schools have been suffering. Joy’s work helps highlight how some of the major offenders are corporations or large investors, not struggling families. Christophe Hunt looked at data from a Pew Survey on attitudes towards technology around the country. There are some really interesting trends here, especially in light of the 2016 election. Respondents in the West were generally most comfortable with new technology, while those in the Midwest were more likely than not to reject technologies like driverless cars. No regions are comfortable yet with robot caregivers or lab-grown meat! Chris Fenton took a look at wages in Rochester, NY, looking at employment distributions and per-job wages. It’s a simple but interesting dive into the economy of a small city. Over the last four months, the increasing amount of time I’ve been putting in at work made it difficult to be the kind of teacher that I want to be. By the middle of October I knew that my schedule was unsustainable. I let the administration know that I’d grind out the semester the best I could, but that I wouldn’t be available to teach in 2017. I hope to teach this course (or its successor) again in the future, but that day looks pretty distant at the moment. Thanks to my boss Arthur, and my colleagues at CUNY, who have been understanding and who I have really enjoyed working with. If you are interested in teaching in the data program at CUNY (I would highly recommend it) feel free to email me (first.last @ gmail) and I can put you in touch with the right people. I think I’ve found a replacement for me, but the program is always looking for qualified people willing to teach an evening a week. It is a cliché to say that you learn as much from your students as they learn from you, but seeing 5 semesters worth of code and visualizations from students has really broadened my knowledge and changed how I think about teaching and looking at data. 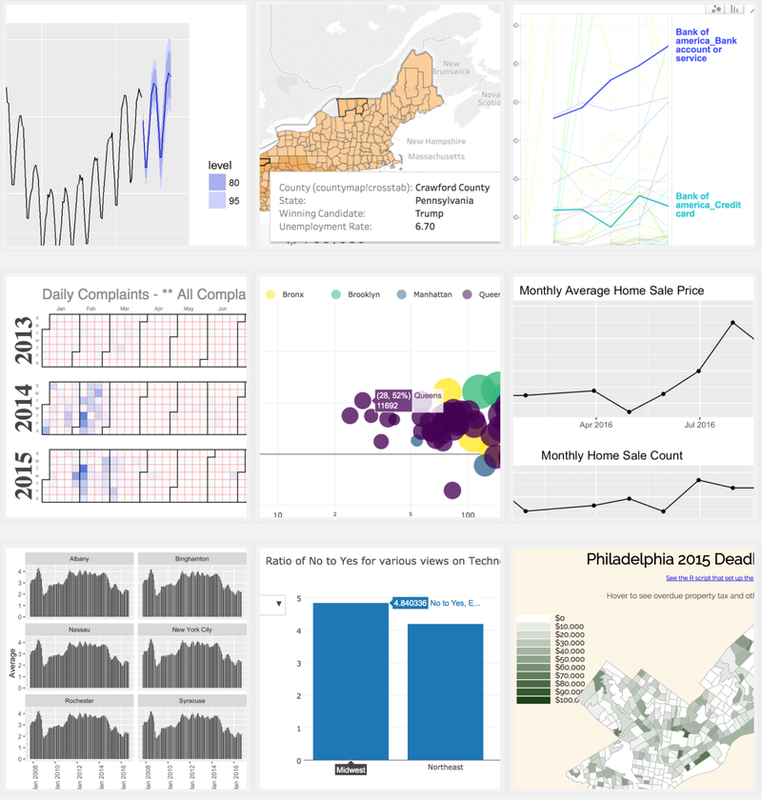 So a big thank you to all my students, this semester and before, who have made teaching data visualization such a rewarding experience.